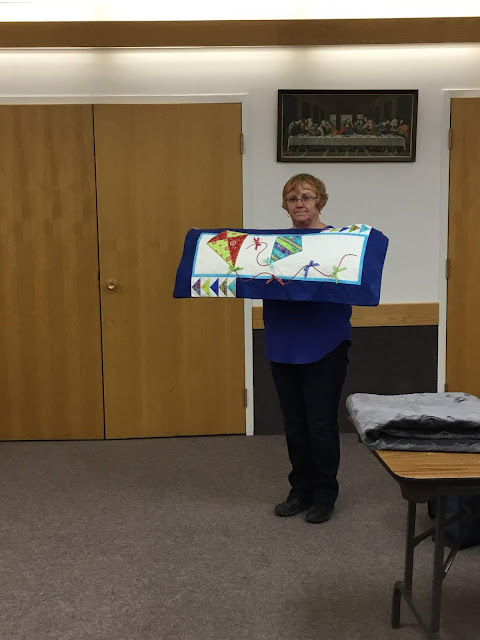 And it's starting too look like spring around Flin Flon .... the sun is still shining past dinner, the snow is melting, a few geese are being spotted in the parks and our Snowbirds are returning home for summer. 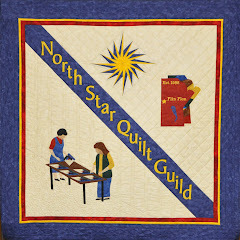 Happy to see so many cheery people back to our guild! 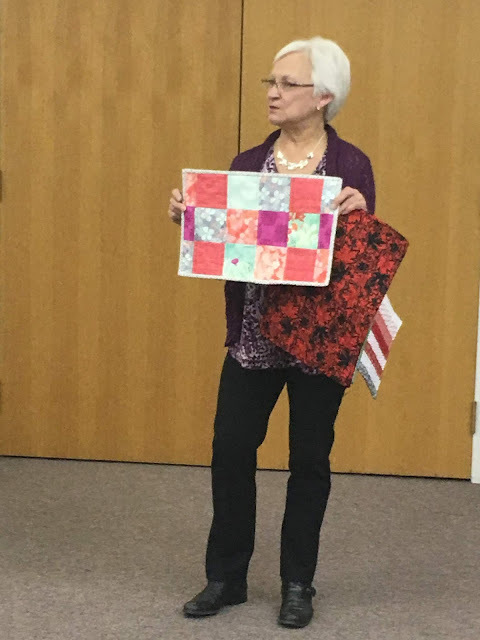 Here's a sampling of our show & tell last night. 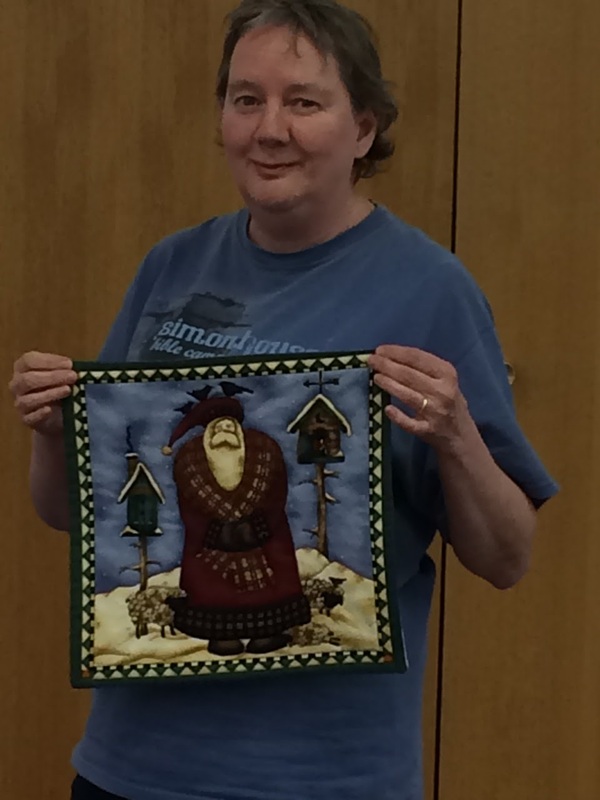 Phyl has been busy with her embroidery machine ... off to buy a bench to show off her cool bench pillows! 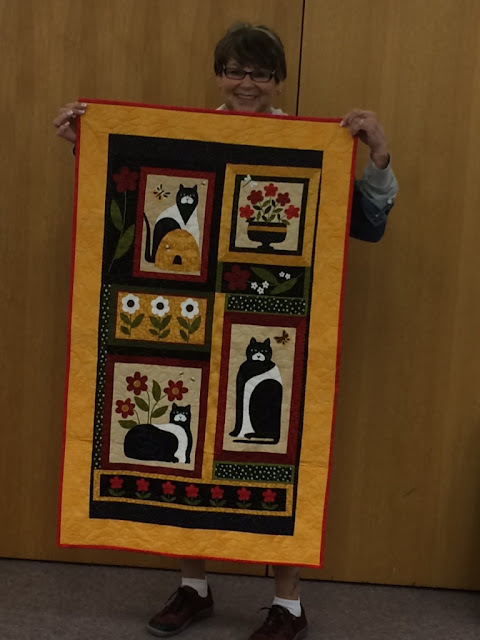 And Audrey .. never wanting to smile for me! 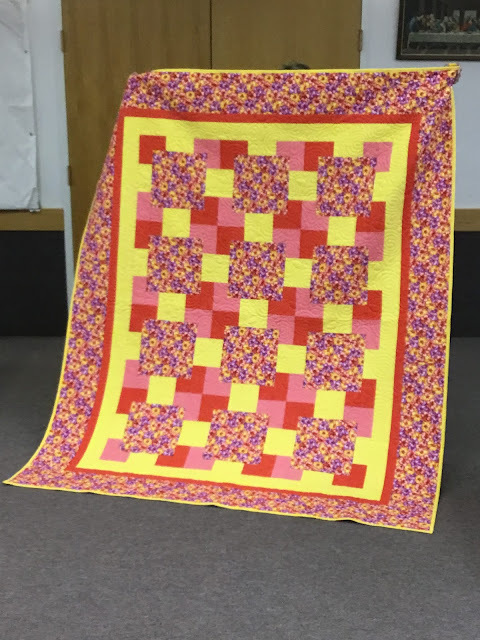 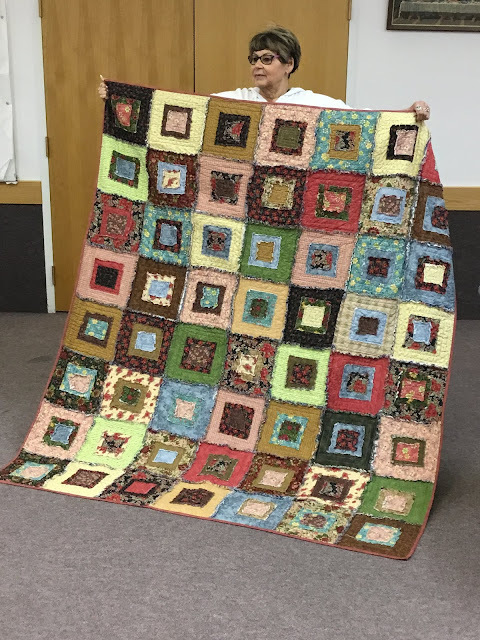 Donna created this sweet boys quilt for our comfort projects ... 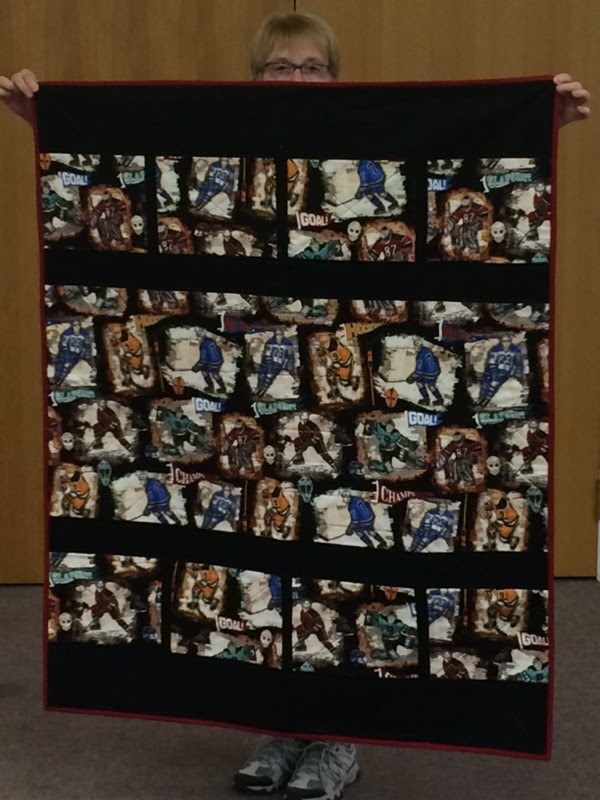 I'll get that quilted up this week! 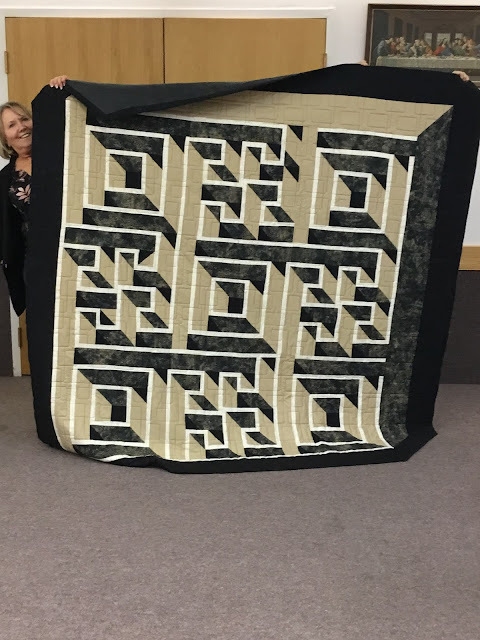 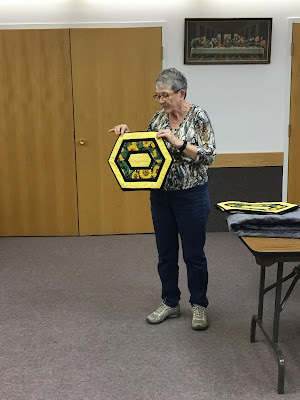 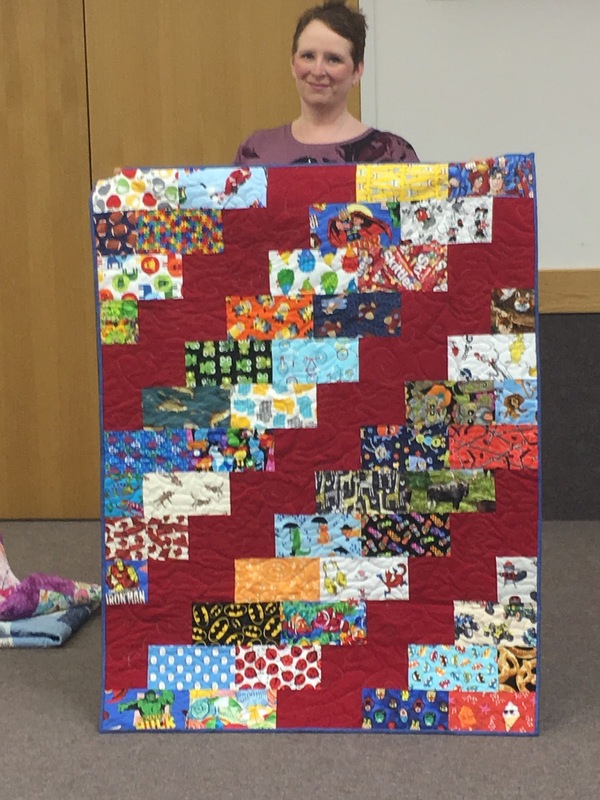 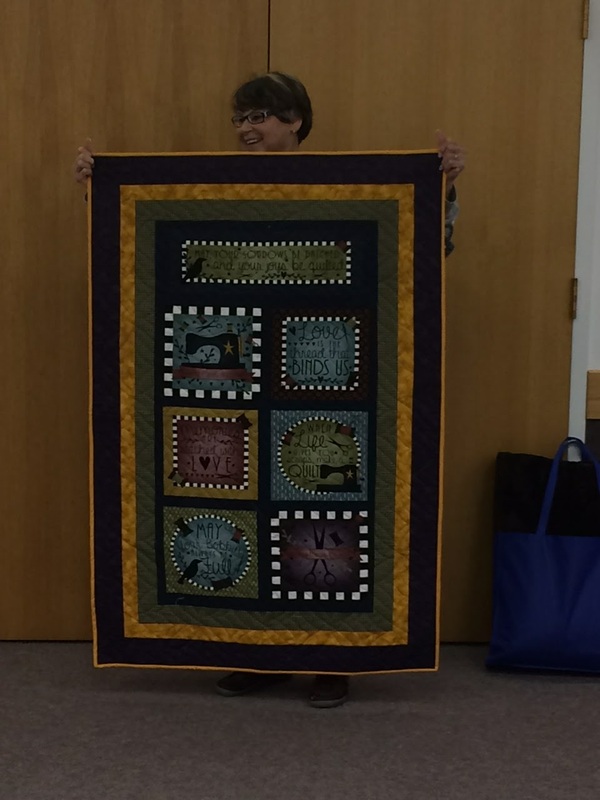 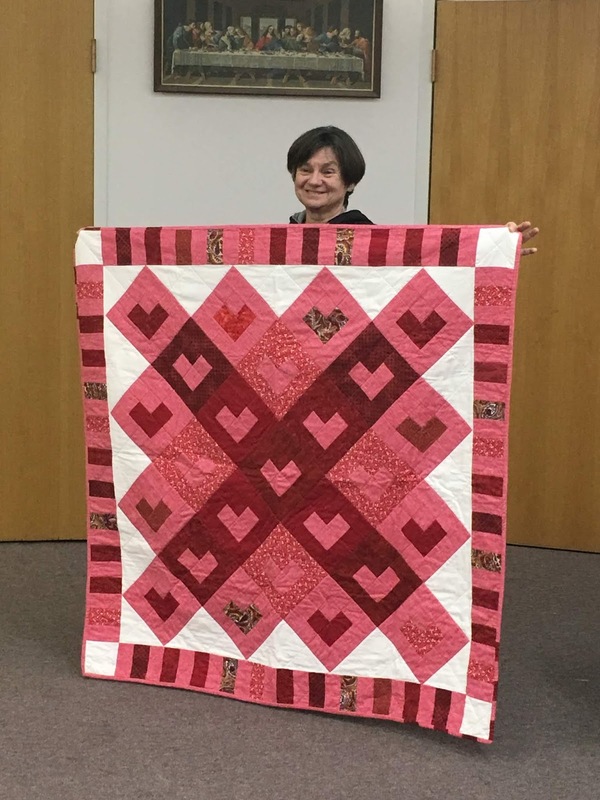 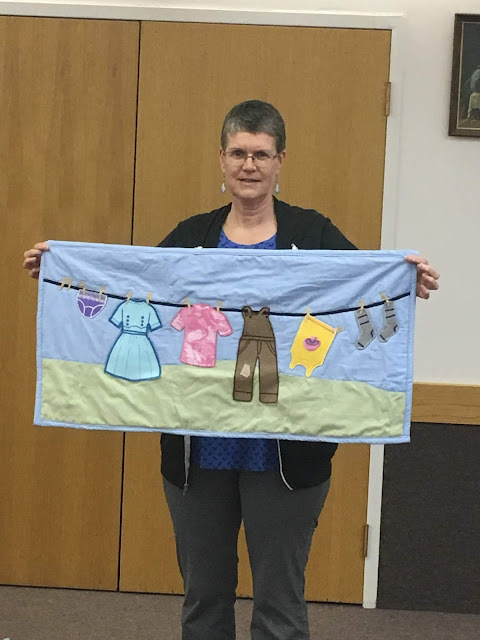 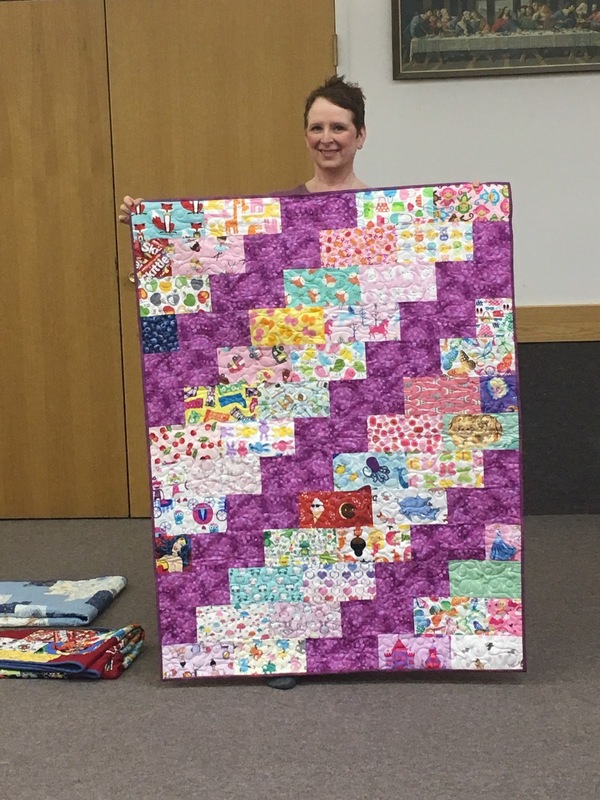 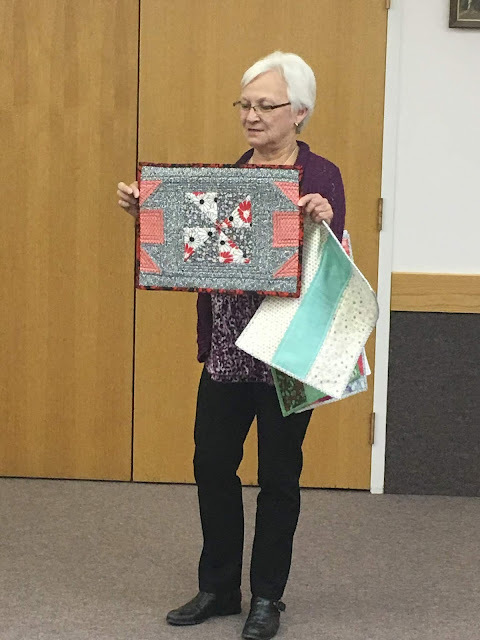 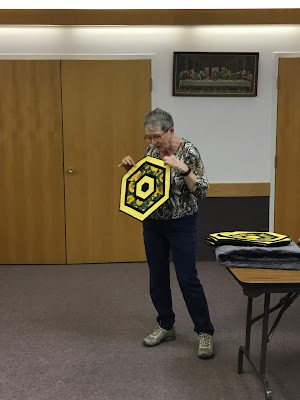 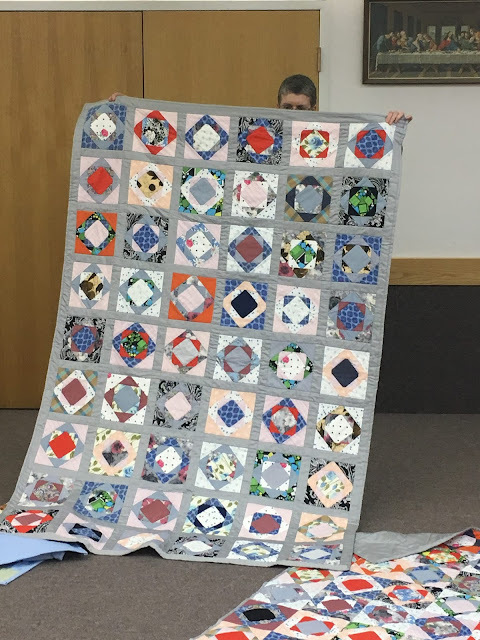 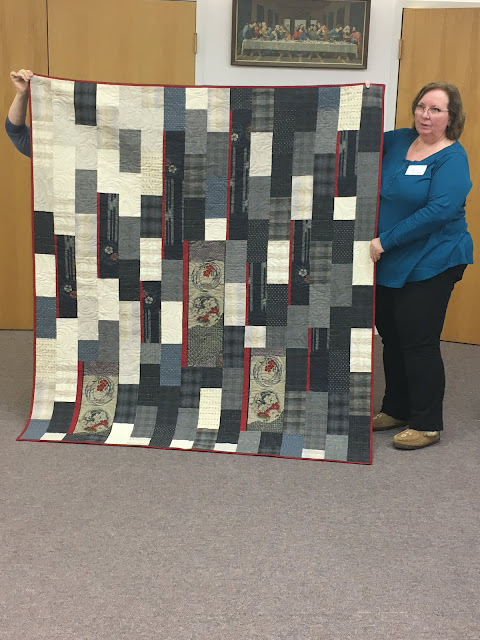 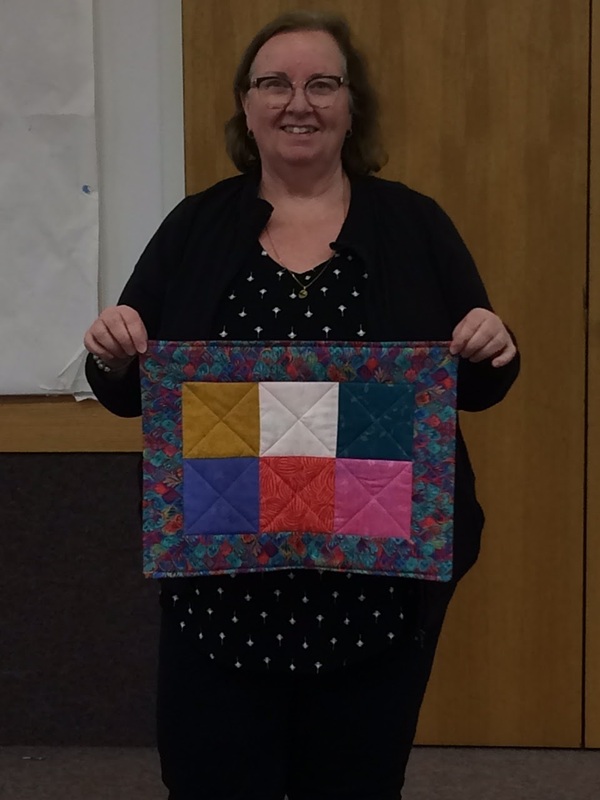 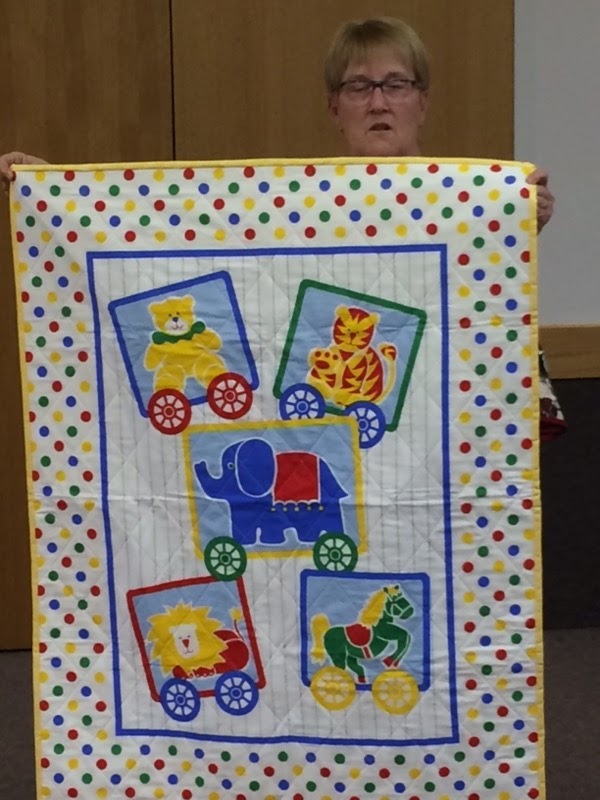 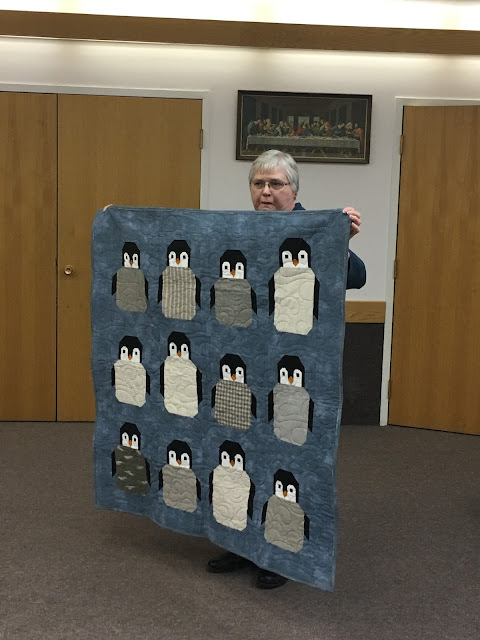 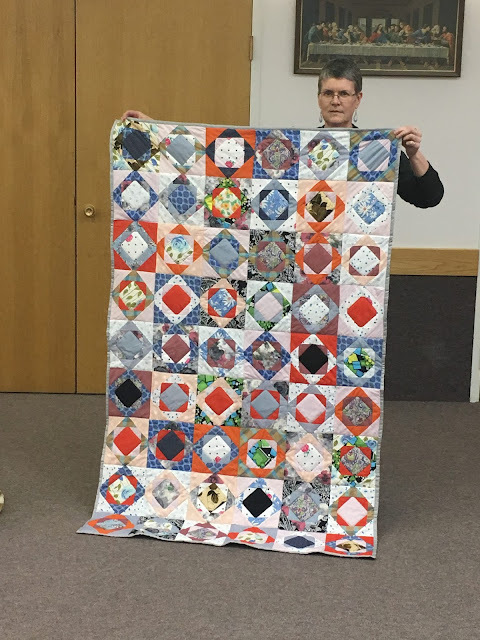 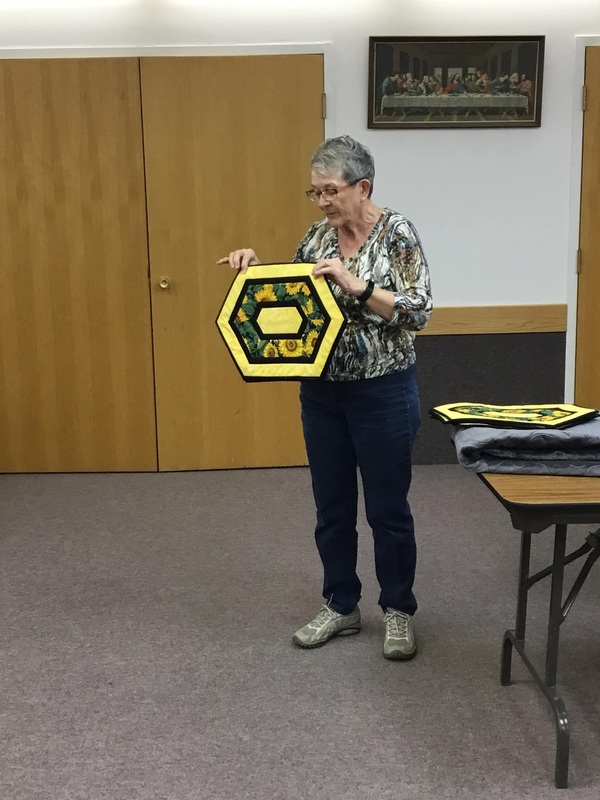 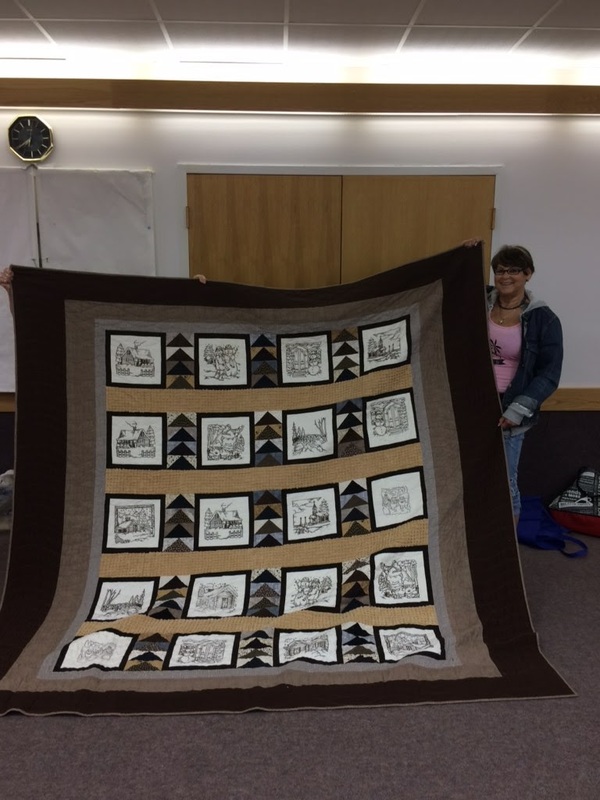 Peg shows off her sweet quilting .... a baby and a big one! 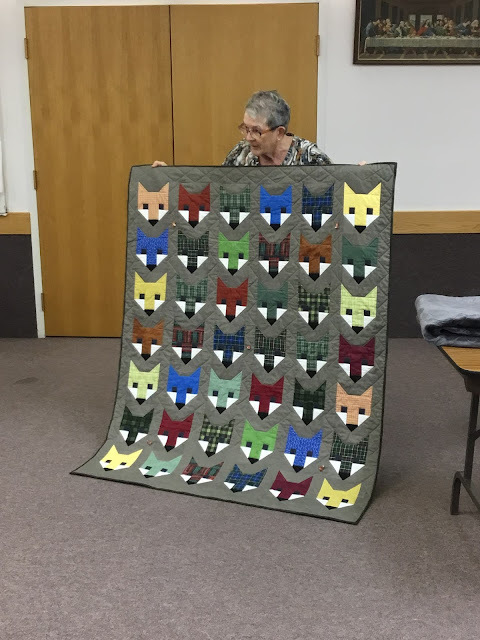 Gladys wowed us with her masculine foxes. 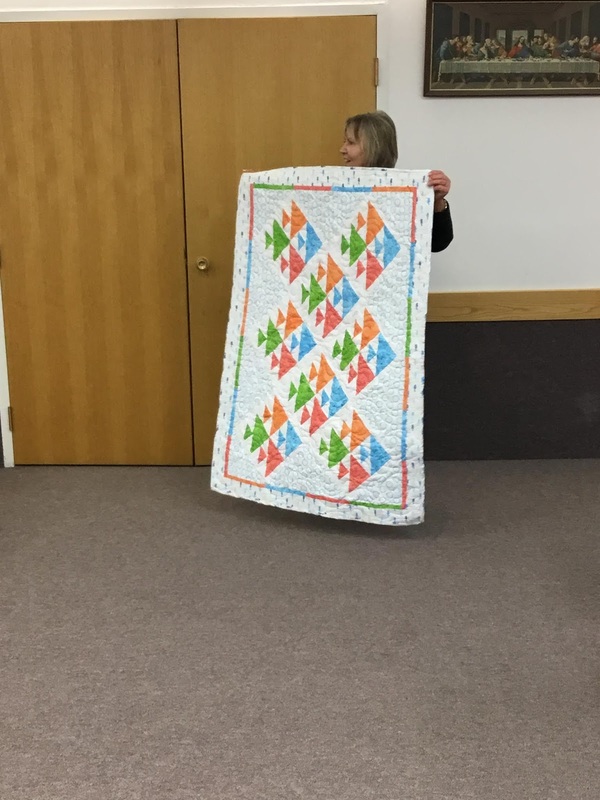 quilt Rae has given them. This is a shot of our next project. 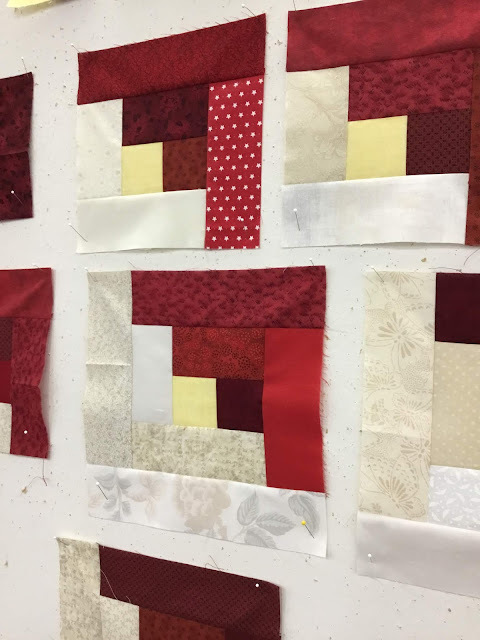 We are making log cabin blocks for the 'Quilts of Valour' program. 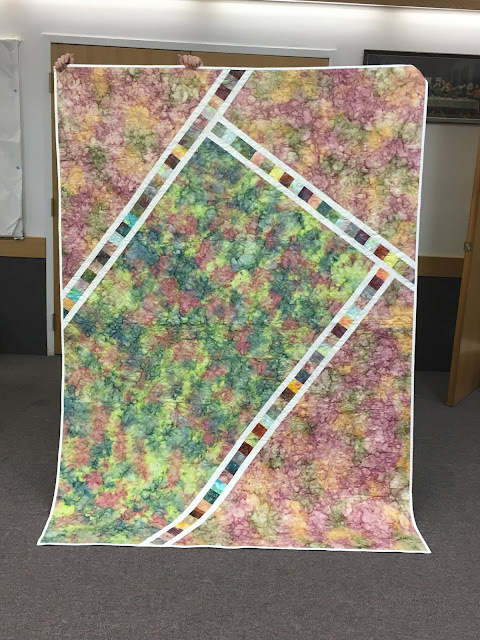 I think they will turn out stunning. 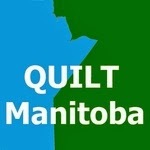 We enjoy taking part in this very special Canadian project. 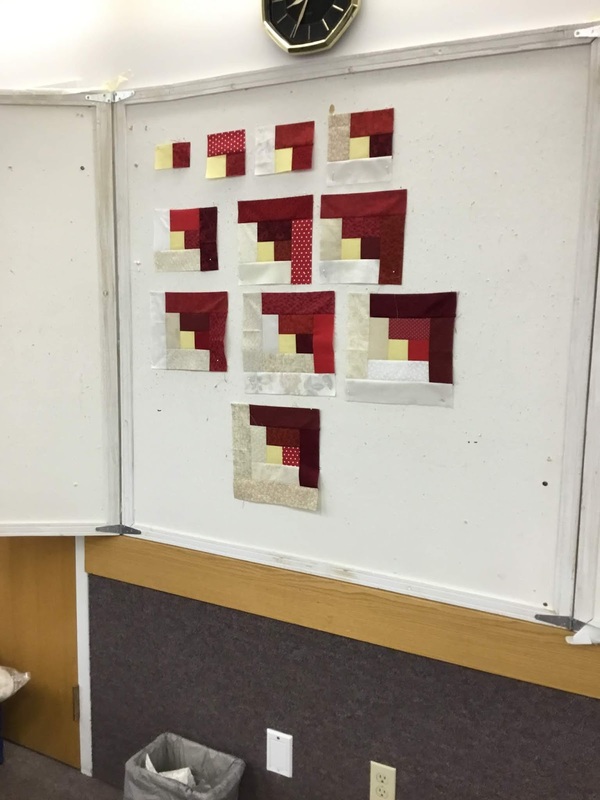 Stay tuned for the finished product! 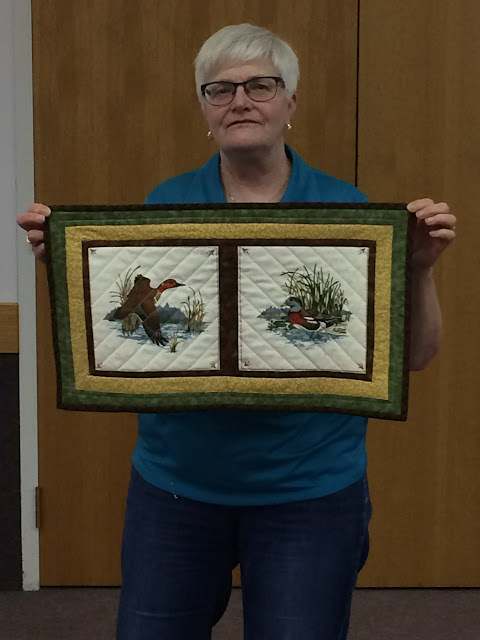 More of Helen ... she awes us every month! 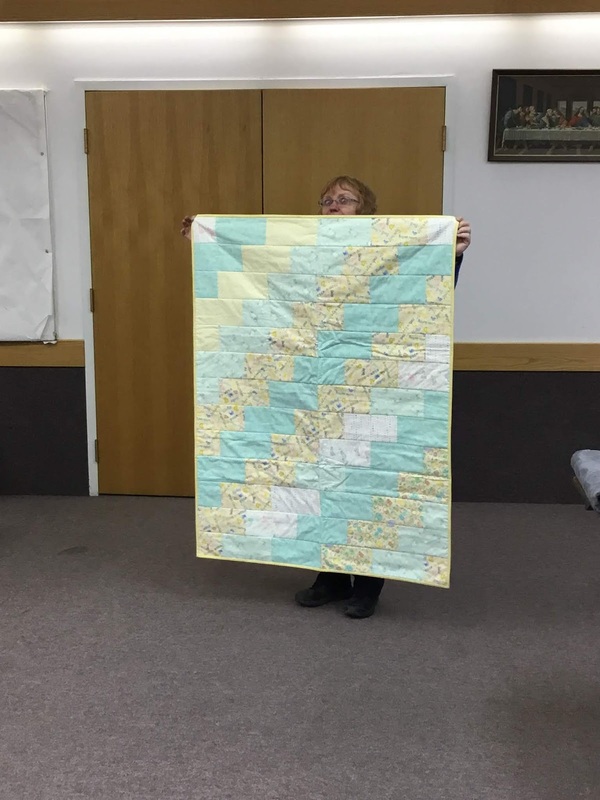 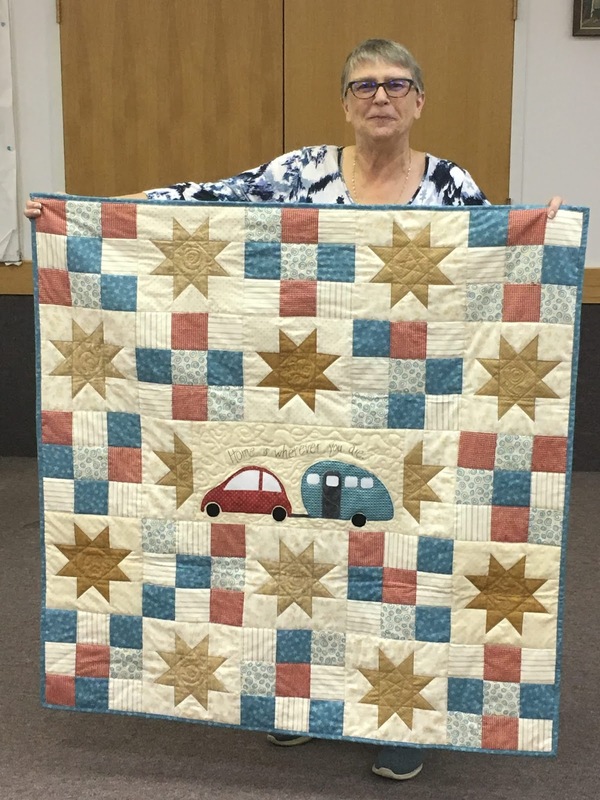 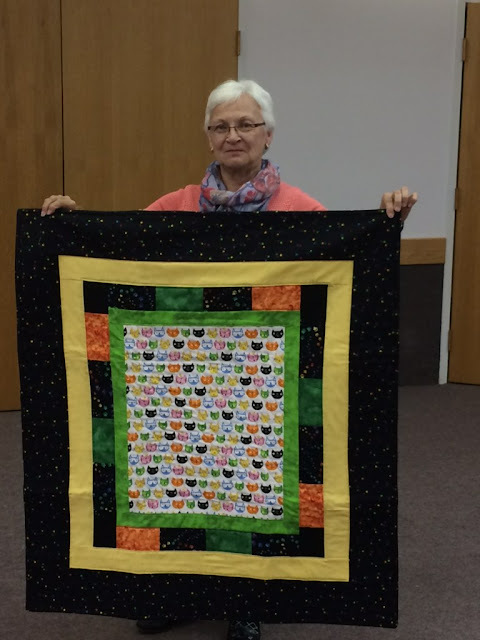 Helen has 9 grandchildren that won't stay small ... she is forced to keep quilting! 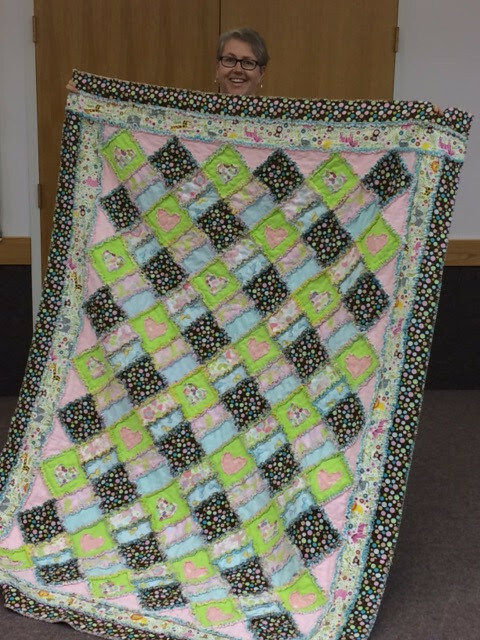 Phyll busy stash busting .... she's likely out of fabric soon .... ha ha! Such lovely models .... We are going to make quilted lap covers for our community friends in long term care. 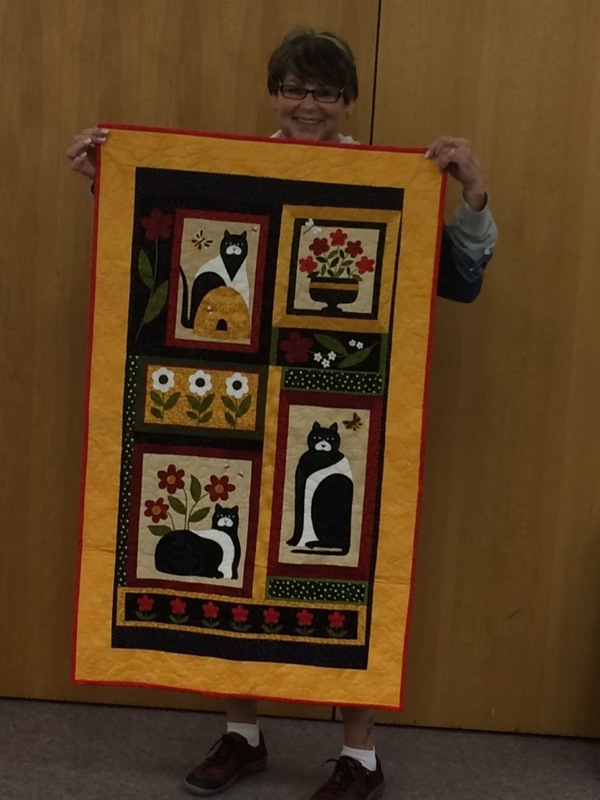 Sandra is a perfect model for this piece and her 'nurse' appears to be really happy helping her out! 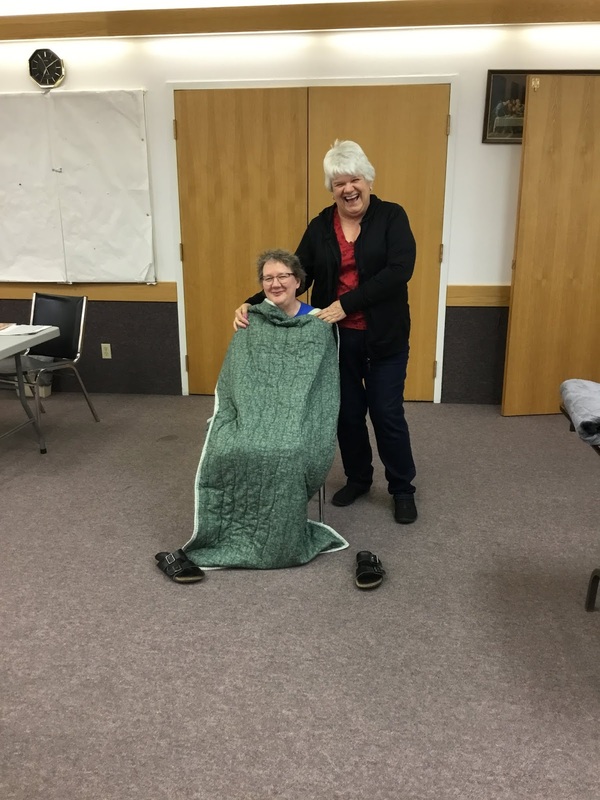 Audrey .... look at the camera! 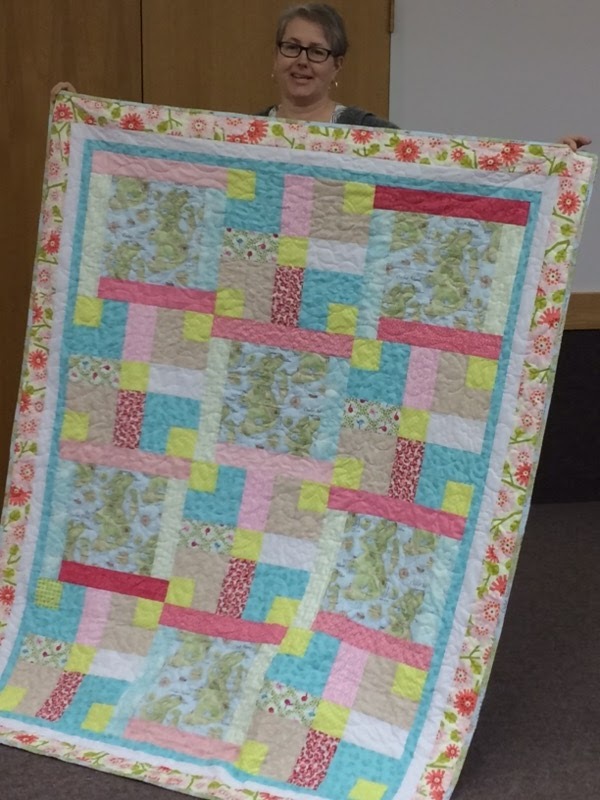 Helen hiding behind this spring beauty. 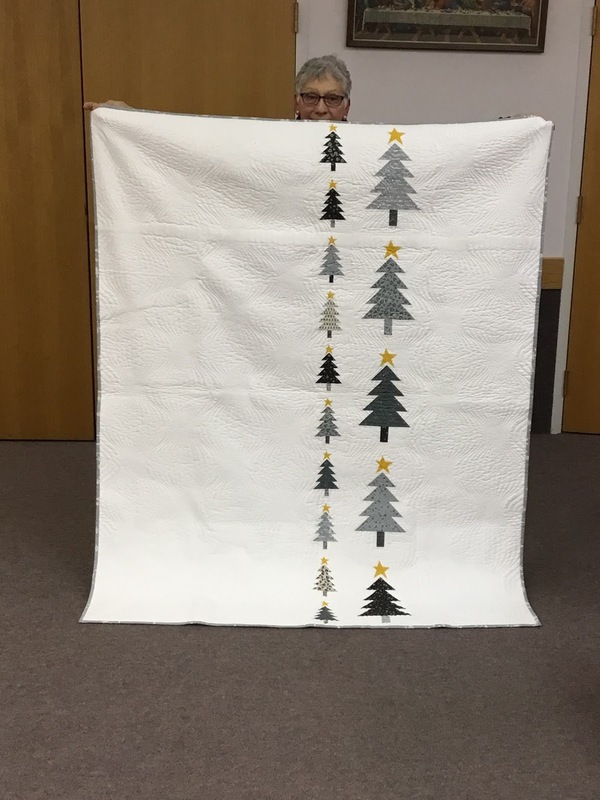 This quilt is heading to the personal care home to spread some joy for a month or two. 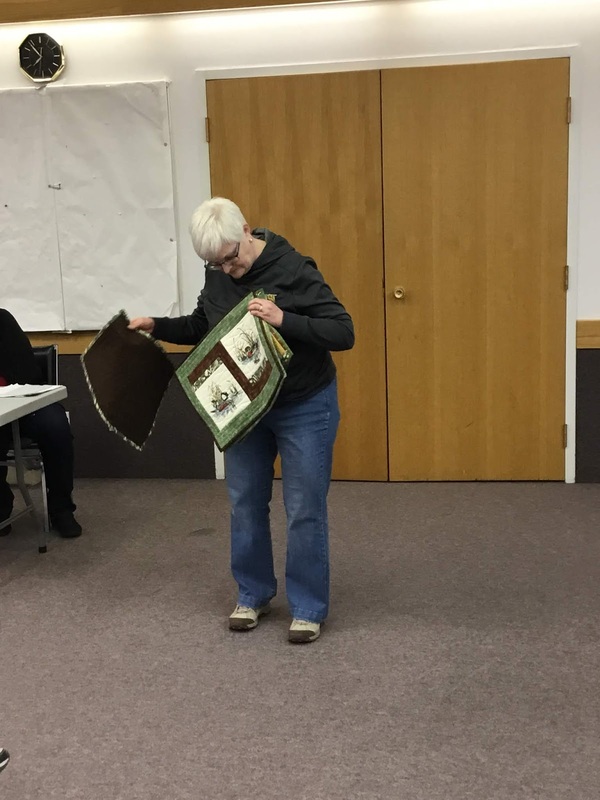 We had a fairly big crowd at our meeting last night with lots of show and tell. Cynthia has been busy cleaning out her sewing room and the meals on wheels program has her to thank for that. 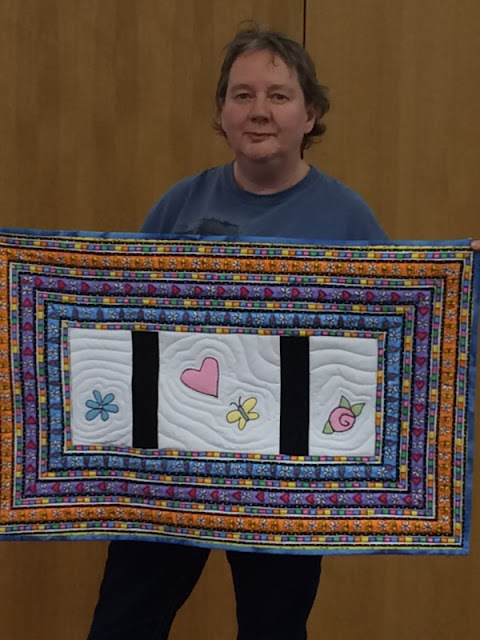 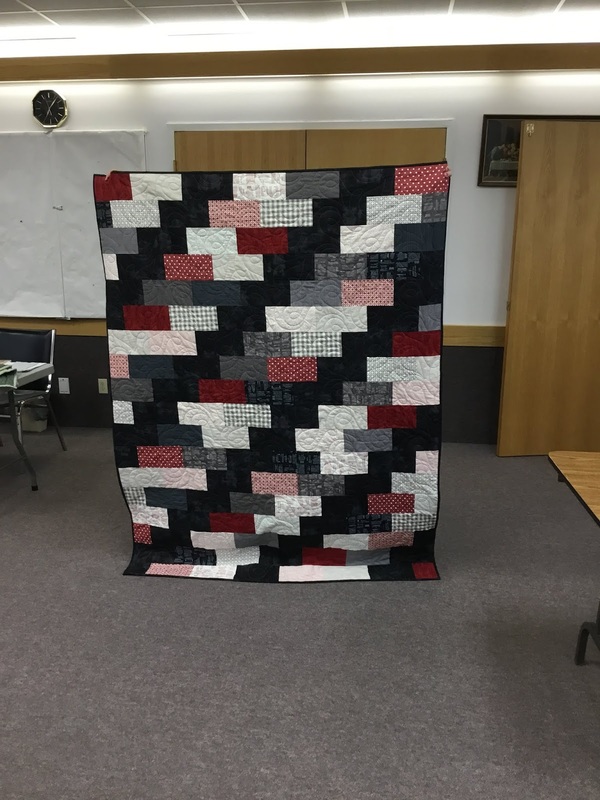 Our mystery model shows a guild quilt .. no home for this beauty yet. I'll make 100 of these sweet quilts before you know it! 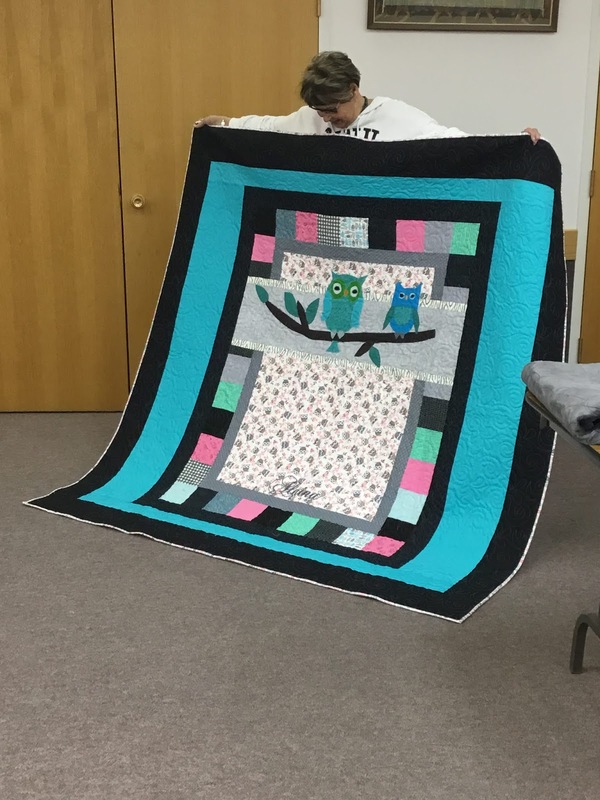 Lynn always wows us .. this quilt is made with traditional Japanese fabrics. 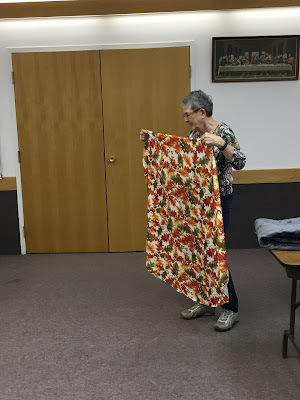 Everyday kimonos are usually muted, low volume pieces. 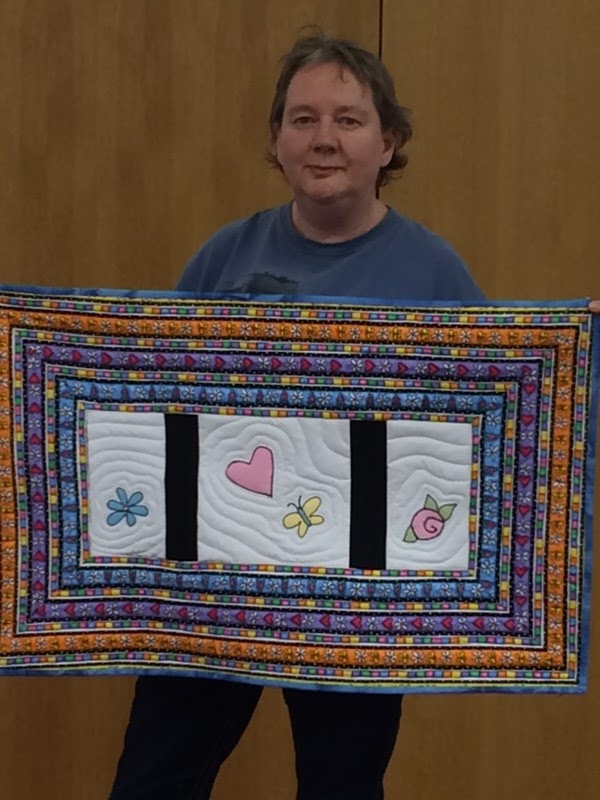 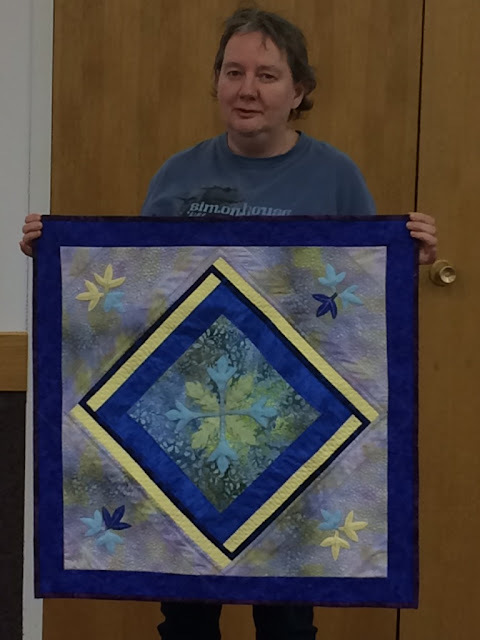 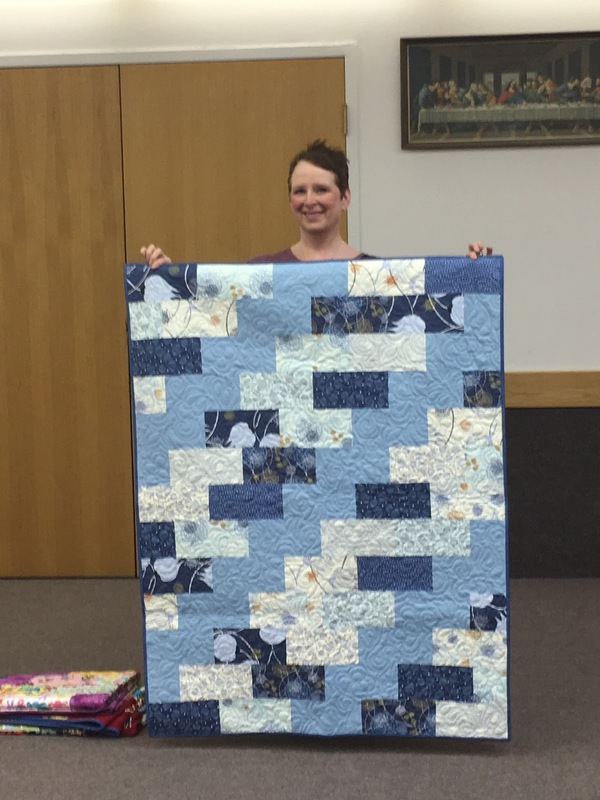 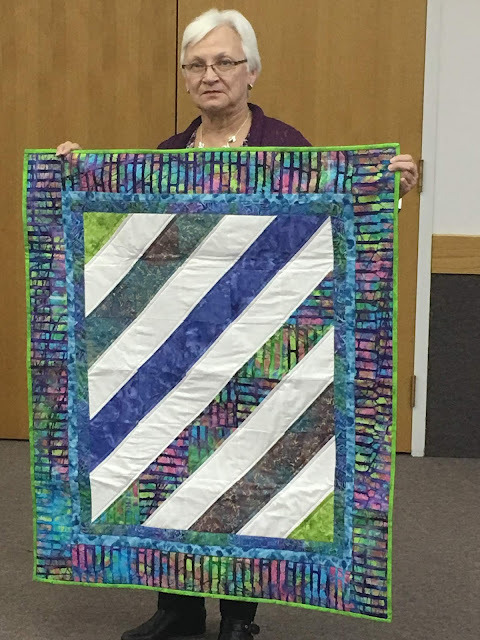 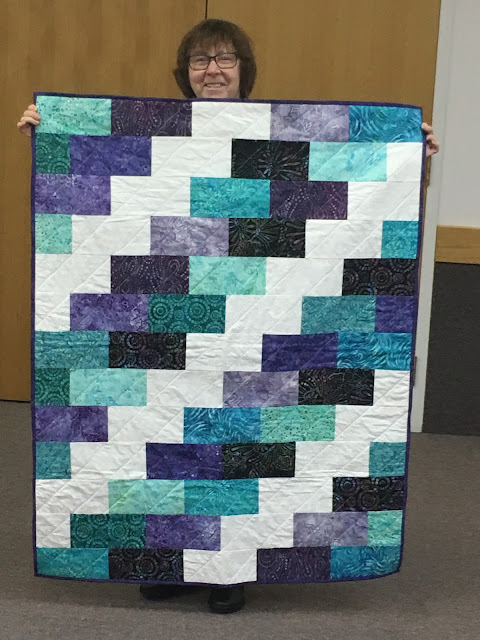 Another new quilter models her masterpiece. 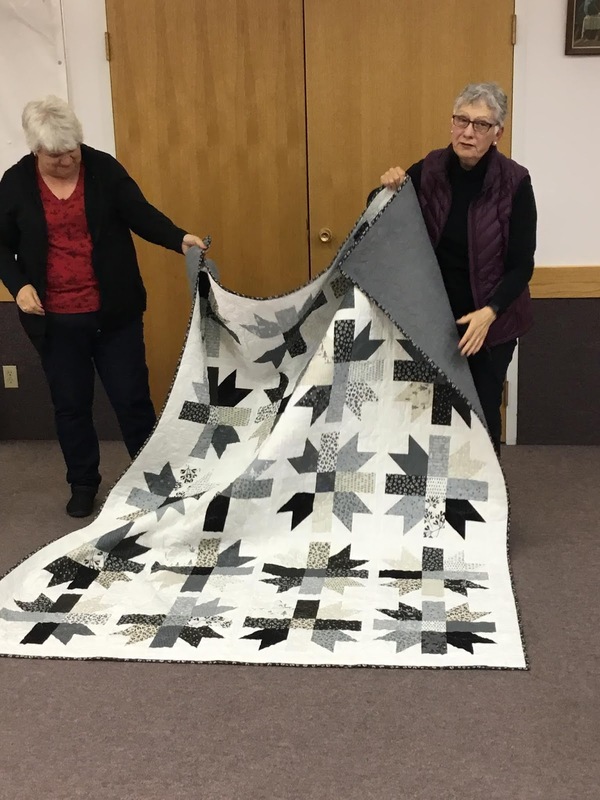 These ladies should be very proud of themselves ...they cut, pieced, quilted and bound their projects all on their own. 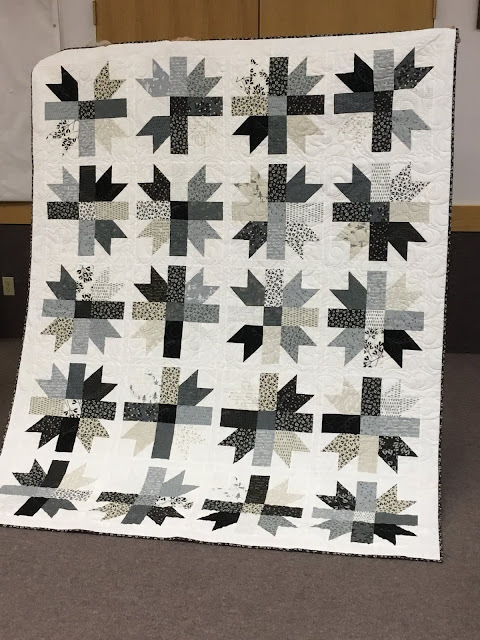 Start to finish completed in no time! My first quilt was not this nice. Vivian was away to Equador and had some textiles to show and tell. 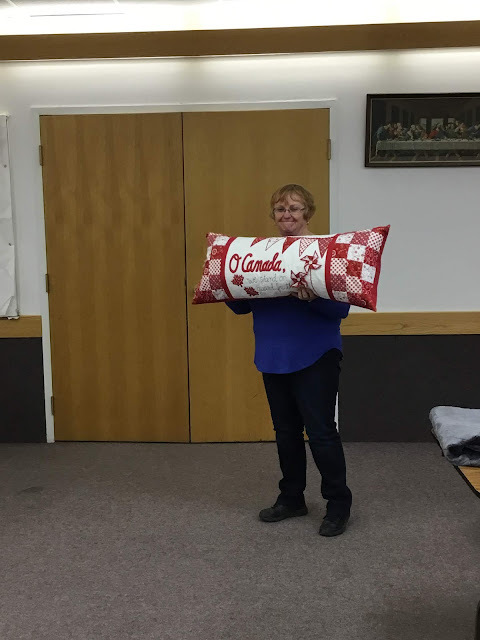 Linda will have a happy great grand child when he recieves this wonderful gift. 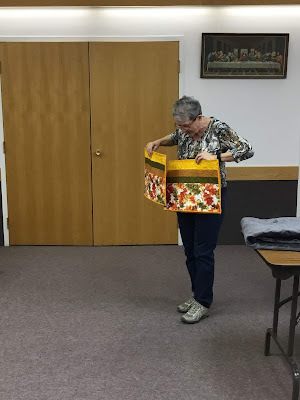 Oh yes ... more placemats for meals on wheels! 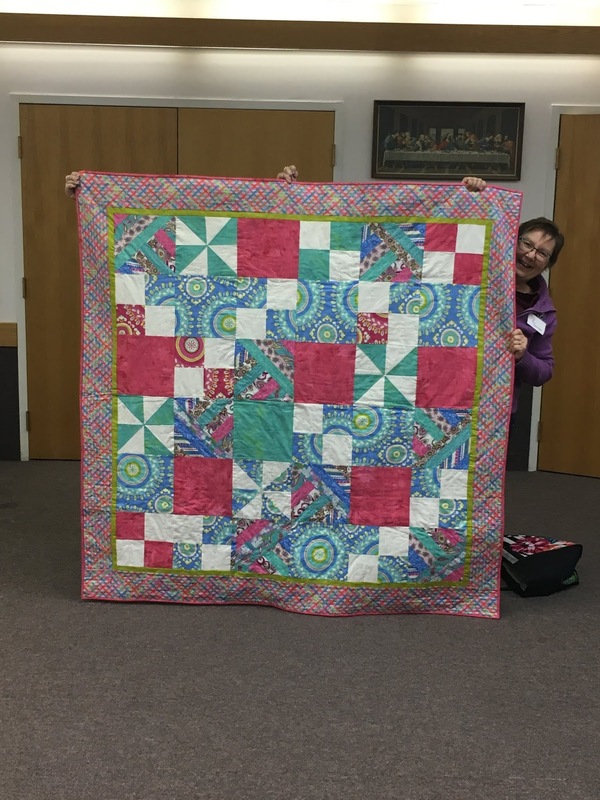 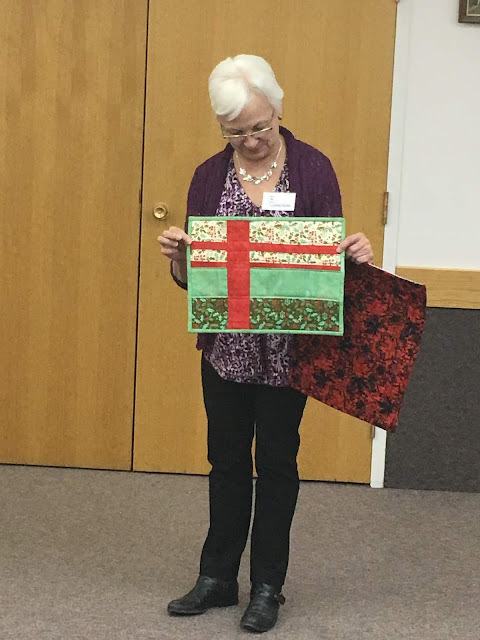 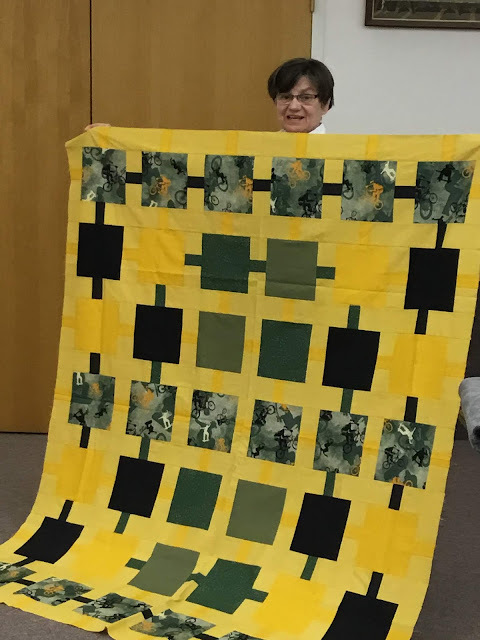 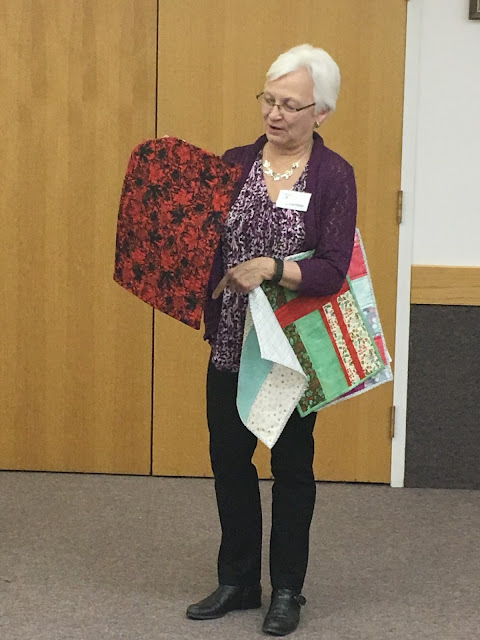 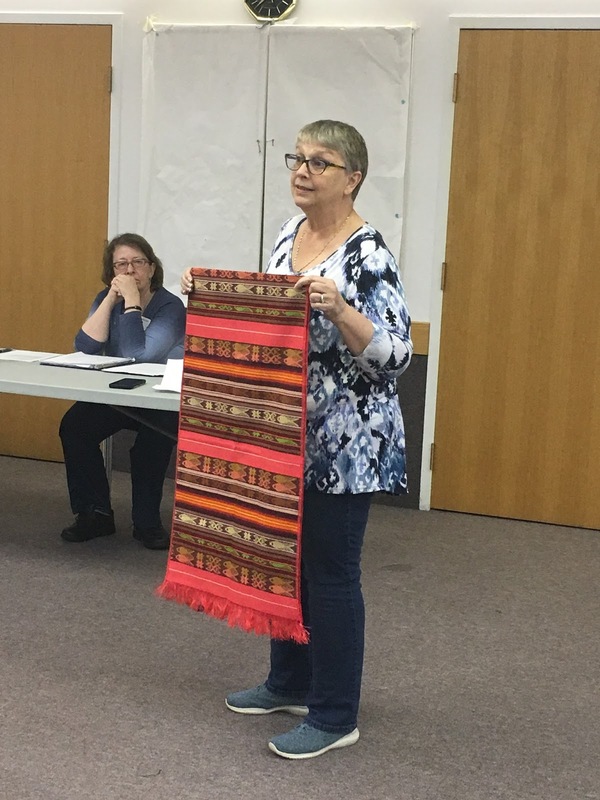 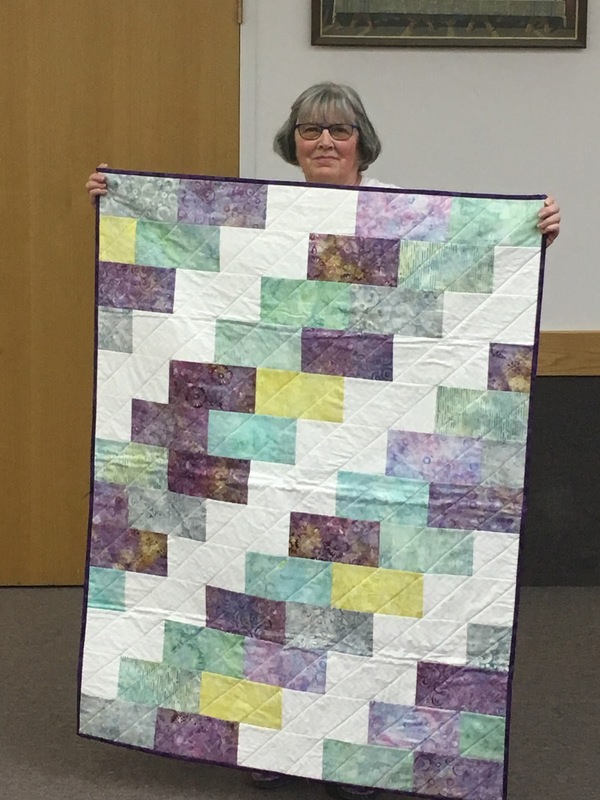 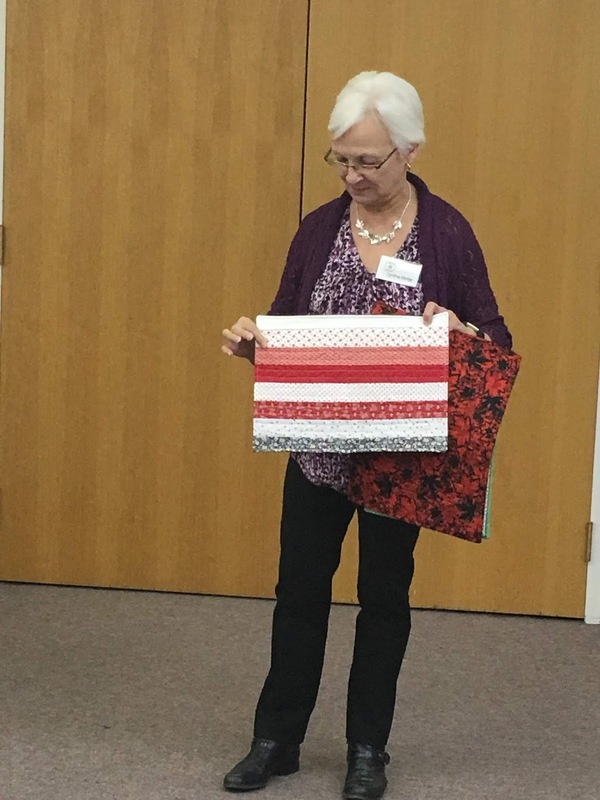 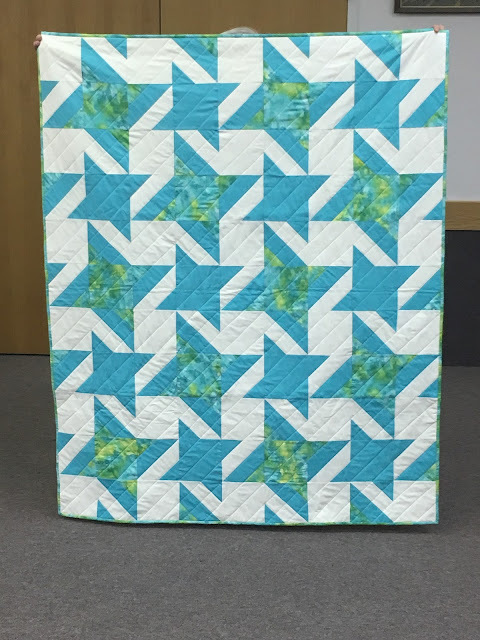 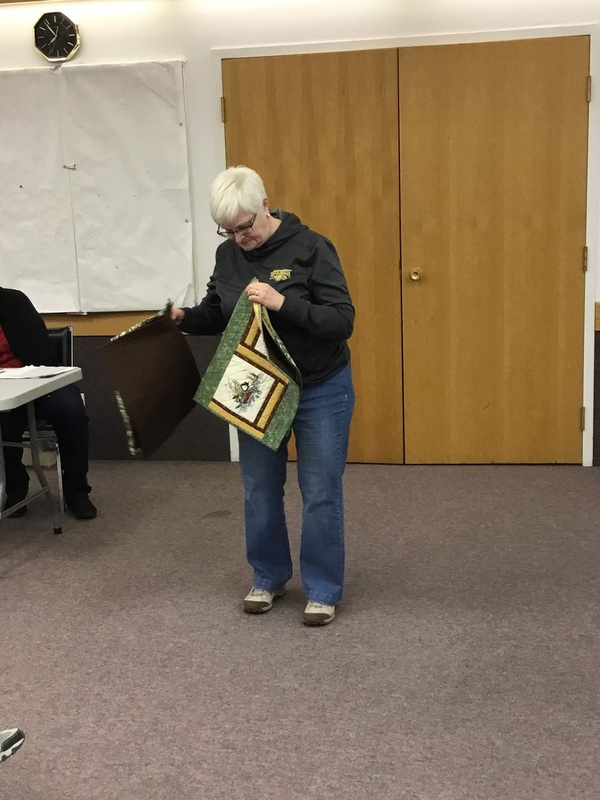 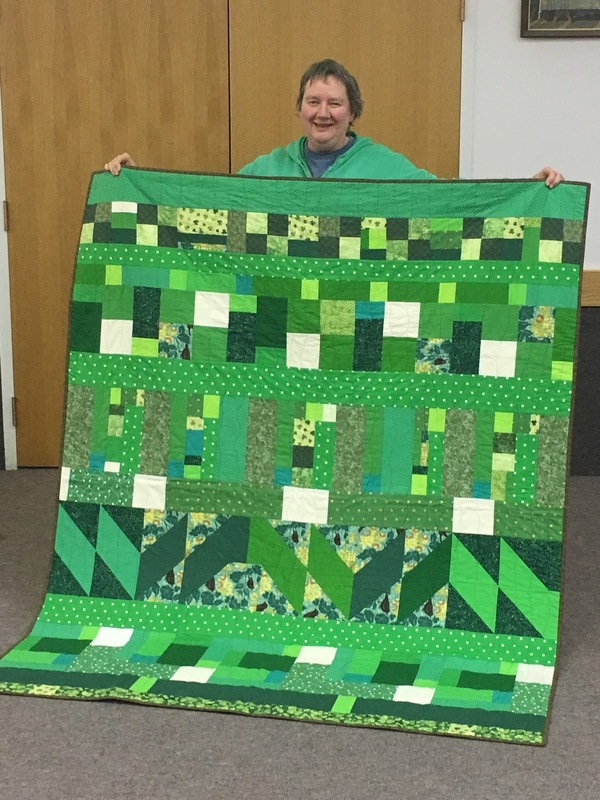 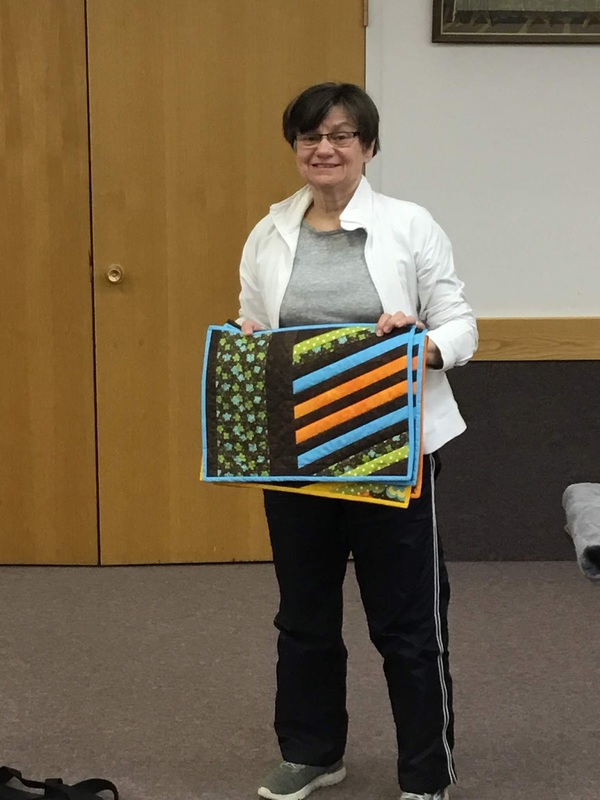 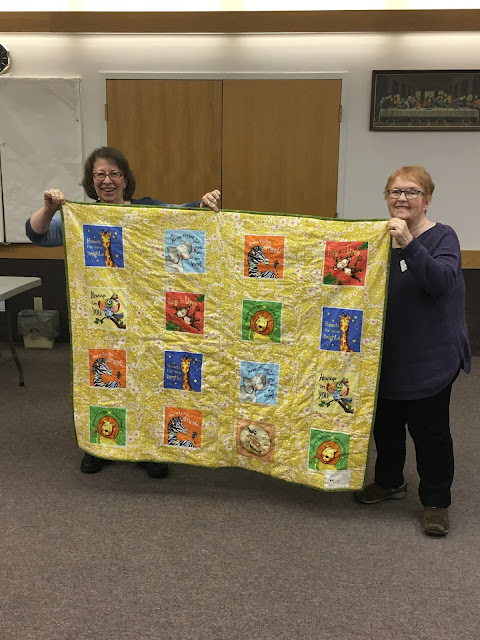 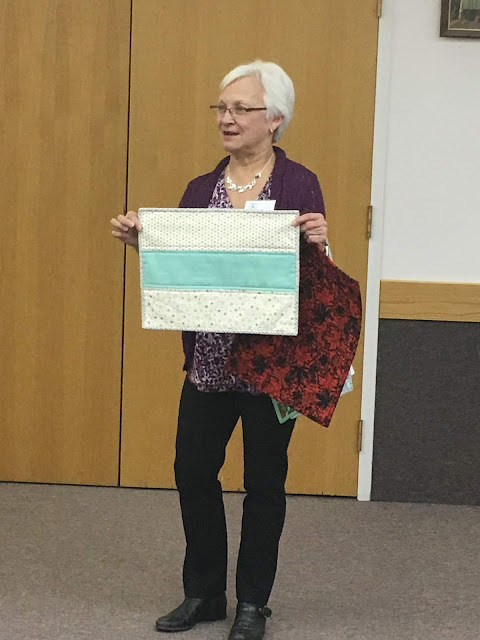 Sandra totally planned to match her quilt ... this guild scrap quilt is called "It's not easy being green"
Audrey took us through a demonstration on mitred borders. 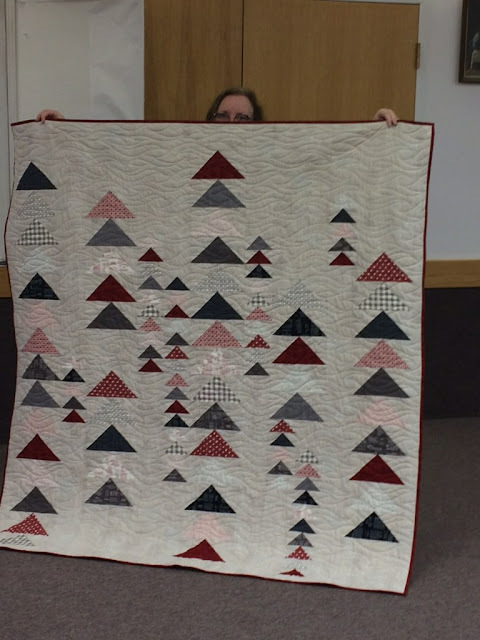 I'm sorry I don't have any photos of it ... 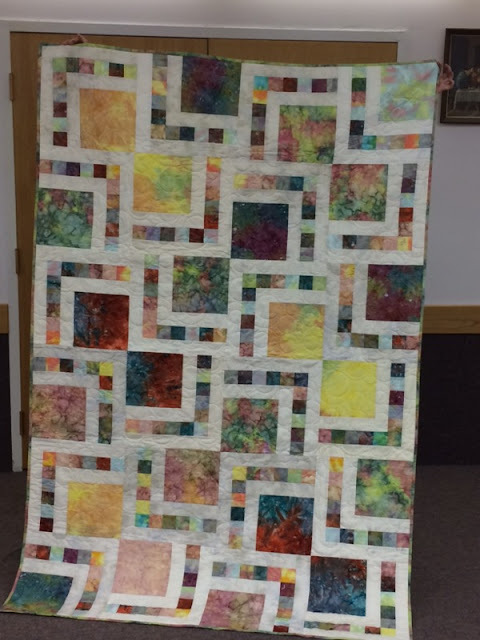 I was too amazed at the process to take good pictures of it!